Integrate Autodesk BIM 360 with HoloBuilder for the full experience and even better project documentation. With HoloBuilder and an existing Autodesk BIM 360 account, you can log in to access your BIM 360 Docs assets/files and import them to be used inside your HoloBuilder projects. Floor plans, pictures, and .dae/.obj files, which have been stored and managed in BIM 360 Docs, can be attached to any HoloBuilder project. For instance, a PDF floor plan residing in BIM 360 Docs can be used within HoloBuilder as a sheet. With the new BIM 360 integration in HoloBuilder, it is possible to connect your Autodesk BIM 360 Docs as well as BIM 360 Field account with your HoloBuilder account for a more convenient file management and task handling. Import files directly from your BIM 360 Docs account into HoloBuilder. There is no need anymore to download and export your files from BIM 360 Docs anymore, you can simply access and use them from within HoloBuilder. Add .pdf or images of your floor plans directly to your HoloBuilder project to work on. Furthermore, you can insert 360-degree images saved formerly unconnected in your Docs account into HoloBuilder to get the whole picture. Learn more! With the BIM 360 Field connection, it is possible to embed issues directly into the 360-degree scene. Place issues within a 360-degree image of your actual site to give anyone working on it the best access to the complete context. Learn more! To use the BIM 360 Field integration, please make sure to update it to Field Manager (next generation) in your Autodesk dashboard! To avoid having yet again a new password and account to remember, you can also sign up to HoloBuilder with your already existing Autodesk account just like with your Google or Facebook account – no additional password required. In order to start using files from BIM 360 Docs and add issues to BIM 360 Field, you first need to establish a connection between HoloBuilder and your Autodesk BIM 360 account as well as the projects you want to link. To work with HoloBuilder’s Autodesk BIM 360 integration, you must first authorize the HoloBuilder app (2.1), then go to HoloBuilder and authorize access your BIM 360 account (2.2) and connect a HoloBuilder with a BIM 360 project (2.3). First, set up the connection with the HoloBuilder app in Autodesk BIM 360 and configure all account and project permissions to get full access. Please note that you will need full admin access rights to set up all permissions within Autodesk BIM 360 correctly. To connect your HoloBuilder account with your Autodesk account, you first need to install the HoloBuilder app within your Autodesk account. Log in to your Autodesk BIM 360 Docs or Field (Gen. 2) account and switch to ‘Account Admin’. In the account admin panel, select the ‘Apps’ tab and look for the HoloBuilder app. Add the HoloBuilder app to your app integrations in BIM 360 by clicking on ‘Add to BIM 360’. Follow the instructions to authorize the app. Switch to HoloBuilder by clicking ‘Open’ and proceed with setting up the integration there as described in 2.2. IMPORTANT: Please check all access & permission rights on all four levels in Autodesk as explained below. Otherwise, you might not be able to successfully link your BIM 360 project with your HoloBuilder project. Users need to be given the corresponding permissions to be able to integrate their HoloBuilder projects with an Autodesk project. Starting with an Autodesk BIM 360 account, over project access rights up to folder permissions. If you do not have the account admin rights, you first need to get in touch with your admin to get the corresponding permissions before you can start connecting the HoloBuilder integration. Please make sure to get all the permissions before proceeding to add the integration within HoloBuilder. Without all permissions, there might occur some problems with the access handling within HoloBuilder. Members must first be added at account level in Autodesk BIM 360. If you do not yet have access to an Autodesk account, ask an admin to add you as a member. This way you will generally become part of your companies Autodesk team. In the ‘Account Admin’ panel, go to the ‘Projects’ tab. From the listed projects, click the project you want to add new members to. The ‘Project Admin’ will open showing the current project members in an overview. Click on ‘Add’ to add new members to the project. Members can be added freely to a project but their permissions to services can vary (see next paragraph: Service level). For full access to all the functionality within HoloBuilder, the user needs Docs and Field member access (see panel to the right above). On the right side of the members’ overview (see image above), the access rights for each service is shown for all users. From right to left: Field Management, Project Management, Document Management & Project admin. Users must be given access to both services, Docs, and Field, for full HoloBuilder functionality. Click on the ‘No access’ symbol in the list below the icon for Field and Docs for any member to give either ‘Member’ or ‘Admin’ access rights. Enable full access by giving member access for the first and third setting from the left. Additionally, the user has to be invited to Field Management Issues. Click on the ‘Services’ tab and select either service in the panel on the right. Enter a member name to be added and select ‘Add’ to provide permissions. Enter the user’s E-Mail address and click ‘Add’. To create and view issues with HoloBuilder the user needs at least “View and Create” permissions to Issues. Last but not least, members must be given access to folders inside a project. There are two default folders, ‘Plans’ and ‘Project Files’. In order to import projects to HoloBuilder, the corresponding Autodesk BIM 360 members must have access at least to the ‘Plans’ folder. You can find the two folders in the panel on the left (see image below). In order to give access to a member, go to ‘Document Management’ as an admin or ask your admin to do so and click on the three dots next to ‘Plans’. Select ‘Permissions’ to manage the permissions for the plans folder. Invite new members here to grant permission to the folder. They only need the lowest access permission ‘View-only’ to have full access from within HoloBuilder with the Autodesk BIM 360 integration. They will be able to import plans, images, and 3D objects directly to HoloBuilder from BIM 360 Docs. After logging into HoloBuilder, open your account setting by clicking on your name in the upper right corner of the browser and then on ‘Account’. In your account, you have access to your profile and billing information and can manage your integrations. In the account settings, choose the register ‘Integrations’ on the left-hand side. Select ‘CONNECT BIM 360 ACCOUNT’ to link your Autodesk account with your HoloBuilder account. When asked for authorization, click on ‘ALLOW’ to continue linking the applications. When asked, enter your Autodesk BIM 360 login info. Once your two accounts have been successfully connected, you will see a confirmation in HoloBuilder letting you know how to connect the projects (see next section 2.3). Log into the HoloBuilder account. Click on the user drop-down in the upper right corner and go to ‘Account’. Click the Autodesk icon to select the integration to be added to your HoloBuilder account. Now that HoloBuilder can access your data, you need to load the HoloBuilder project you want to use to the BIM 360 project (see 2.3). In order to actually access files from within a HoloBuilder project, you first need to connect it to an Autodesk BIM 360 project. You can either create a new project or edit an existing one. Creating a standard HoloBuilder project implies, that you will not directly link your BIM 360 project to the new HoloBuilder project and start your project with imported files. When creating a standard HoloBuilder project, you start your project with files saves on your desktop that you need to upload to HoloBuilder. If you do not have any files, e.g. floor plans or 360 images, saved on your local drive but in your BIM 360 Docs account, select ‘Import BIM 360 files’. With this option, you will connect the HoloBuilder project you are just creating directly with a BIM 360 project to access the corresponding files. The project you are about to create will be created directly with the files stored in the connected BIM 360 project. 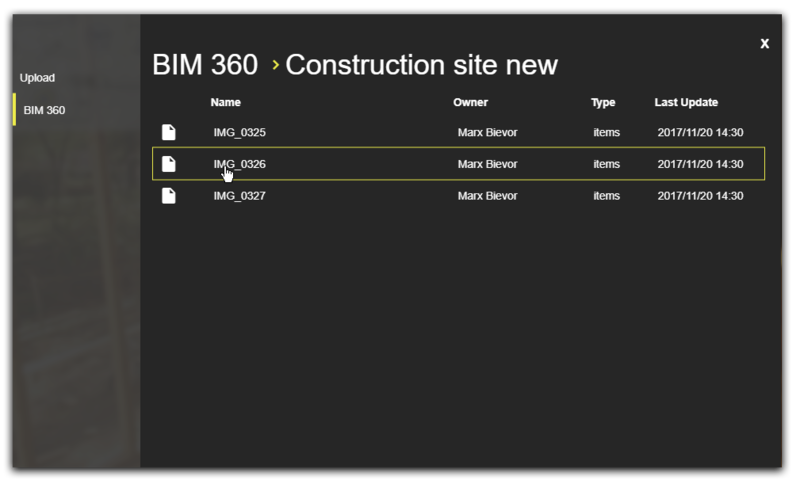 If you do already have a HoloBuilder project you would now like to connect to your BIM 360 project, simply open the project from your ‘My Projects’ list. In the project, click ‘Connect BIM 360 project’ next to the ‘Save’ button to connect it to a BIM 360 project. Alternatively, you can also click on the +-button. On the left, select the tab BIM 360 and choose the BIM 360 project you would like to connect this HoloBuider project to. In the appearing popup, select the BIM 360 project you want your currently opened HoloBuilder project to connect with. Clicking the project in the list will directly establish the connection. You will see a little confirmation in the lower left corner. The overview will switch to the folder structure of your BIM 360 project, directly enabling you to integrate any BIM 360 files of the newly connected BIM 360 project. Once you have connected your accounts and projects, you can start adding files directly from your BIM 360 Docs account as floor plans or 360-degree scene images. Depending on the file format you have different options. You can easily navigate through the project’s folder structure by clicking on the items with the folder symbol . Click on a file item to add this file to your HoloBuilder project. Currently, you can add .pdf as well as .png/.jpg file types to your HoloBuilder project from your connected BIM 360 project. Please note that any updates made to files saved in BIM 360 Docs that are imported into a HoloBuilder project, will not yet synchronize. When changes are made to a file within BIM 360 Docs, you need to replace the file within HoloBuilder manually. Synchronizing docs will become available starting 2018. .pdf files can only be added as floor plans to a HoloBuilder project. When clicking a .pdf file from the BIM 360 Docs project folder, the file will be imported into HoloBuilder and the screen for adding a new sheet will pop up. If the .pdf file has multiple pages, choose which pages you want to import into your HoloBuilder project with the radio buttons at the bottom. Crop each page to the desired view if necessary. To import .pdf files with a higher resolution, toggle the switch at the top to ON. Click on ‘IMPORT’ to finally add your .pdf file as new floor plan to your HoloBuilder project. Select an image file to be added to your HoloBuilder project from your BIM 360 Docs project. Click on the image file you want to import into your HoloBuilder project when highlighted to add it. As for now, you can only add one image file at the time. When choosing an images file, .png or .jpg, from the connected BIM 360 project, you can decide whether you want to add the image file as a floor plan or a 360-degree scene. In order to add an image file as a 360-degree scene, make sure that the image format for 360-degree display you are using is supported in HoloBuilder. In general, HoloBuilder supports standard 2:1 equirectangular image formats as well as 6×1 and 6×2 cube maps. Click on the desired option in the small popup to import the image file accordingly. Select a .obj or .dae file to add the 3D model into your HoloBuilder project. Click on the highlighted 3D model file you want to import into your HoloBuilder project. As for now, you can only add one file at the time. The 3D model will be added to the currently opened 360° scene. Move, scale and rotate the model as any other object. Learn more about importing 3D models into your 360° scene here. Please note that this integration is only available with BIM360 Field 2nd Generation. BIM 360 Field enables you to create issues which will be assigned to team members within BIM 360. With the BIM 360 Field integration for HoloBuilder, you can easily create new BIM 360 Field issues as interactive action objects directly in your 360-degree scenes. Every issue you created from within HoloBuilder automatically contains a URL which directs you to the affected area in your 360-degree documentation where you have placed the issue link before. Anybody can find the related area of an issue with a single click in BIM 360 ‍Field. Please note that any created issue does not yet get synchronized if any changes are made within HoloBuilder or within BIM 360 Field to an issue. Synchronizing issues will become available starting 2018. To create a new issue from within HoloBuilder, drag and drop the Issue object from the action bar on the right-hand side into the 360° scene. You can place the object in any location in the scene and scale it as any other action object within HoloBuilder. Once the issue object was dropped into the scene, you need to specify the issue title and description set a type and location, and add a due date. When clicking SAVE, the issue specifications will be also forwarded to your BIM 360 Field project. You can now log into your Field account to access and work with the issue you have just created within HoloBuilder. In the issue in BIM 360 Field, you will additionally find a link to open the exact location of your issue in the 360° tour in the HoloPlayer. Currently, it is not possible to edit a BIM 360 issue created within HoloBuilder, neither within HoloBuilder nor within BIM 360 Field. In order to change an issue, you need to replace it completely. In order to remove an issue, select the corresponding issue object from the scene and click on the recycling bin that appears on the right. Confirm if you are really sure you want to delete the selected issue. Please let us know if you still have any remaining questions regarding integrating your Autodesk BIM 360 projects with HoloBuilder and feel free to contact us to acquire further information on this or any other topic. We are happy to help. Write us at support@holobuilder.com. This entry was posted in HoloBuilder Tutorials, What's new? and tagged 360 camera, 360°, Autodesk, Autodesk BIM 360, Autodesk BIM 360 Docs, Autodesk BIM 360 Field, BIM, Building, Building Management, construction, editor, highlights, HoloBuilder, improvement, Issues, new features, Tutorial, virtual reality, virtual tour, VR. Bookmark the permalink.